While many of these channels have been known to researchers for years, the University of Delaware's Xiao-Hai Yan research team has uncovered a previously unaccounted for pathway transporting heat from the Pacific Ocean to the Indian Ocean, and even further to the Southern Ocean, which surrounds Antarctica. A recent study, using models and data from 2003-2012 by Yan and colleagues at Princeton University, Xiamen University and University of Texas at Austin, revealed the warm water may be taking a shortcut in the Eastern Indian Ocean along the western coast of Australia. This warm water makes its way to the Southern Ocean more quickly than previously known or reported—revealing an important link between the Indo-Pacific Ocean and the Southern Ocean during a La Ninã weather pattern, which is the cooling down of the Pacific Ocean along the equator. "When heat flows from the Pacific into the Indian Ocean, we expect that heat to follow the south equatorial current from the Indonesian Throughflow down to the eastern coast of Africa," said Yan, the Mary A.S. Lighthipe Professor in Marine Studies and director of UD's Center for Remote Sensing in the College of Earth, Ocean, and Environment. "Instead, the data and model results showed that the abnormally warm water traveled closer to Western Australia, suggesting that other processes were driving the water southward." This increased transfer of warm water to the south has important climate consequences, Liao, a co-author from Princeton University said. It can affect the amount of rain that falls over Australia's western coast and increase the frequency of "hot events" that can cause coral bleaching, a phenomenon where coral expel the symbiotic algae living inside their tissues in response to heat stress, placing them at greater risk of mortality. Australia's Great Barrier Reef is still recovering from devastating bleaching events in 2016 and 2017, resulting from sustained high ocean temperatures amid a strong El Niño weather pattern. Co-authors on the study include Enhui Liao, the paper's lead author and a former doctoral student of Yan's now at Princeton University; Jiang Yuwu from Xiamen University in China and Autumn N. Kidwell from University of Texas at Austin. 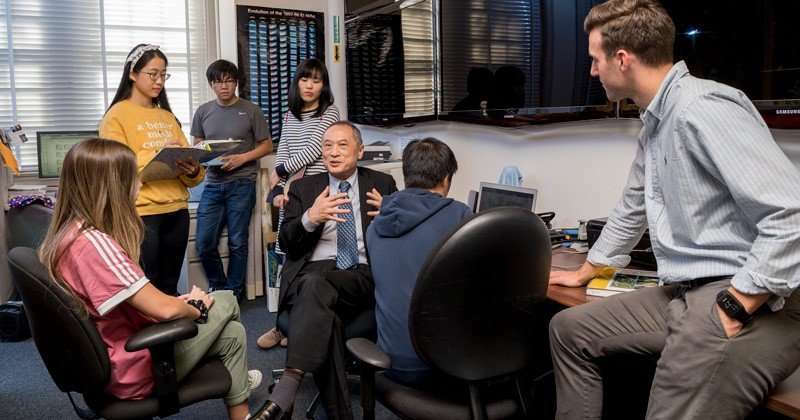 Yan and members of his lab have spent years studying what is known as the hiatus period of global warming, observed from 1998 to 2013 and caused by heat redistribution and storage in the deep ocean. Yan explained that during this time period almost all of the ocean basins' deep layers became warmer. "In the global warming hiatus period from 1998 through 2013, the Southern Ocean including the Agulhas Region had never slowed down. It was still warming," said Yan. According to Han and Yan, increased salinity in the ocean during the hiatus period was mainly responsible for the interior ocean warming. This increase in salinity forced the heat to move horizontally, instead of following the water column's downward, vertical movement, as was typical during the acceleration period. This horizontal forcing, Yan said, led to higher temperatures in the ocean interior during a time when most of the ocean showed a decrease in surface temperature. In addition, they found that the Agulhas Current and Agulhas Leakage—a current of water that drifts into the Atlantic Ocean rather than going to the Indian Ocean on its normal trajectory—serve as pathways for heat to be transported between the Indian Ocean and the South Atlantic Ocean. "They link the climate change "switch" at the Atlantic Ocean and "engine" at the Western Pacific Ocean together," Yan said.